“We got woken up 3 nights between twelve and three in the morning by planes. My husband said ‘that’s the Russian bears going to Cuba.’ It still gives me the shivers thinking about it. We didn’t think we would survive the night.” Agnes gave a chilling recollection of a world living in fear. 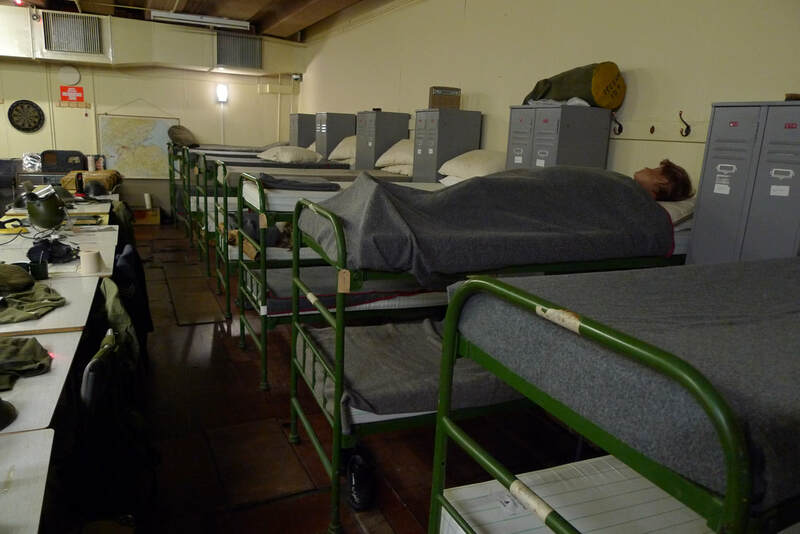 The Cold War was the reason for the existence of Scotland's Secret Bunker. It was built in 1951 as a command centre to be used in the event of a nuclear attack. The facility was maintained and ready for action right up to the late 1980s. When the Soviet Union collapsed the threat of nuclear war was gone and in 1994 the bunker opened to the public. Agnes was working on the reception during my visit and she told me that the farmhouse that we were standing in was simply to disguise the bunker, to avoid arousing suspicion. It certainly appeared to be a good camouflage as we were in Fife countryside where fields and farmhouse is all there is, but Agnes pointed out a flaw. "Notice that the building has a veranda. Have you ever seen a Scottish farmhouse with a veranda like that? No. You see, they were built to the same design as telephone exchanges, so if you see a farmhouse with a veranda in the countryside it probably means there's a bunker under it." Well, from that moment on I began to take a closer look at the farm architecture on my travels. Would I discover another bunker, yet to reveal its secrets? ​The cycle route to the bunker is largely characterised by non-descript fields, not the most inspiring landscape I have experienced, but that is probably why there is a "secret" bunker in such a place. As my train pulled into Cupar a man with thick glasses and polite manner asked "Can you please move your bicycle, so I can get my unicycle out?" Yes, there was actually somebody taking a unicycle on the train. As we got off the conductor pointed at it and asked me "do you not fancy one of those?" Cupar station is a grand survivor from the Victorian-era. An upper floor with bay window suggests that it once provided a cosy home for a stationmaster. A profusion of chimneys hints at coal fires burning in waiting rooms in years gone by. The station gardens are perhaps the only tradition remaining from that era- they provide colour and fragrance for arrivals and departures. The tree-lined River Eden flows through the town and has a walkway alongiside it that I used to begin my cycle. This pleasant stretch was shortlived as I next took the B940- a busy little road. I got off it as soon as I could with a left turn, signed for Kemback. This was an instant escape to the empty rural roads that I always try to seek out. It twisted and turned with a line of tall hedges on each side- like one of those country avenues that fill cyclist’s dreams. My enjoyment was cut short by a landslide on the road. It was a scene of total destruction and there was no way through. I had to turn back and use the B940 again, but thankfully it started to get quieter after Pittscottie. I was deep within functional farming landscapes. There were sheep and cows staring at me, their heads turning to follow my progress and make sure that I wasn't going to suddenly leap into the field to get them. If it was the year 1759 animals could have found themselves fleeing from a descending hydrogen ballon, piloted by a pioneering Italian. Incredibly, these ordinary fields were the place where Scotland's first ever flight had landed. In that year Vincenzo Lunardi took off in his ballon from Edinburgh and flew 46 miles to this location. I had never known about this until I chanced upon a tiny plaque by the side of the road. Of all the things I expected to come across out here this was not one of them! And I nearly missed it, the plaque is so small. How many locals have driven past it for years and never seen it? If there is a list of unusual and unexpected things to find in Scotland, this has to be added to that list. I imagined a flamboyant gentleman, with neckerchief blowing in the wind and a moustache that curls up at the edges, stepping off the ballon at Ceres as bemused locals looked on. Today’s locals are currently locked in battle against the building of wind farms. I passed a mural depicting a man kicking a wind turbine, as if it were a rugby ball, out of a field. 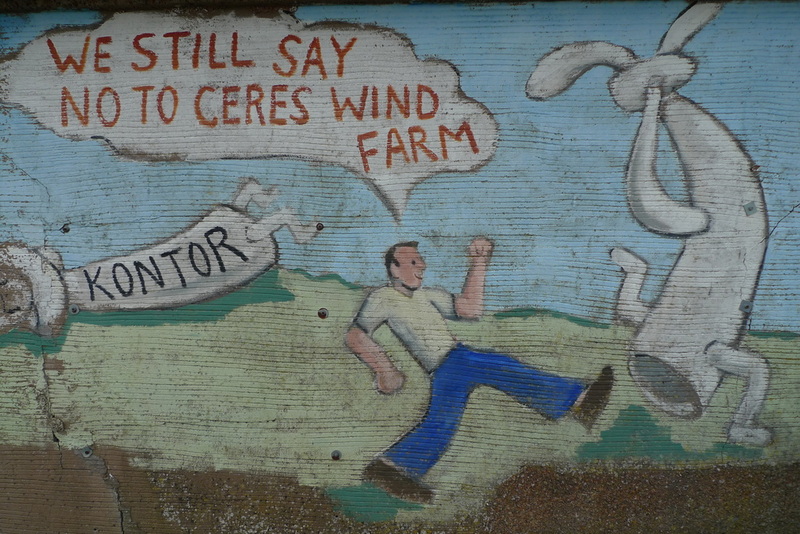 The speech bubble above his head exclaimed "we still say no to Ceres wind farm." ﻿﻿I crawled through Raderni, detained behind a bin lorry making its rounds. Two West Higland Terriers came bounding across the freshly cut lawn of a stone cottage. One of them gave me a “yap, yap!”. The sea came into view and with it enough wind to furl a sail. It hit my face, fresh and sharp and I had to put more effort into my pedal strokes. Pet dogs, sea views and villages were a world away from the serious business of responding to a nuclear attack. And yet, it is within this land that I was able to descend into a secret underground command centre. Locals would have been oblivious to its existence, but had they stumbled upon the entrance to the bunker and pleaded for help they would be gunned down by the guards. There were many more shocking truths for me to discover. 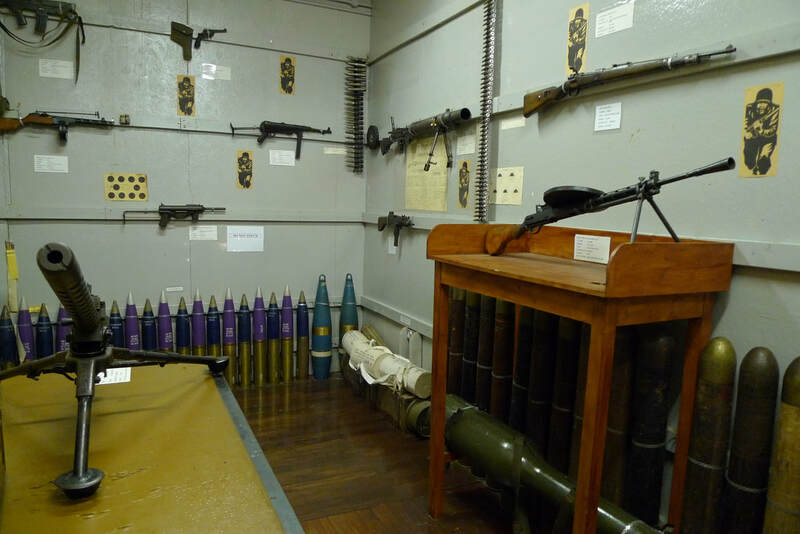 Cyanide was kept in the armoury in case an attack resulted in the bunker's tunnel being blocked and there was no way out, or the world above ground was uninhabitable and there was nothing to come up for. Chilling public information films are shown in the theatre- these would have been broadcast in the event of an attack. They give instruction on how to dispose of a dead body and how to protect your home with sandbags, which would have been futile in a nuclear war. 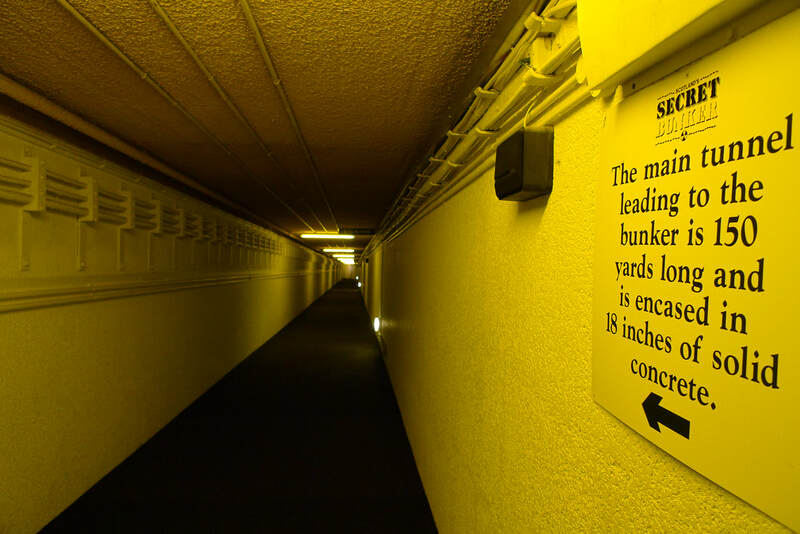 The bunker is a miniature town with everything that the workers would need for comfort. There is a plant room that can provide electricity for 3 months in the event of a power cut and filters that prevent radioactive particles from entering the air supply. There are dormitories, a chapel, and a canteen. The canteen operates for visitors and has been kept in an authentic 50s style with music of the time on the sound system. The other noises that I can hear reflect the business end of the bunker. Speakers emit a soundtrack of announcements, beeping equipment and a constant hum of serious conversation. The operations rooms are complete with furniture, equipment and mannequins in uniforms of the Cold War era. It made me feel that the place was still operational and that I was witnessing something that I should not be seeing. In fact, there are still secret rooms down here that we are not allowed to see. Behind a locked door there are the bedrooms for the top military staff and the Secretary of State. I wondered how luxurious these rooms would be, but more intriguingly there is reported to be other stuff in here that is still too sensitive for the public to see. Military personnel still visit the facility to look after whatever is in there. Only Cleo is allowed through that door- she is the resident Ministry of Defence feline and I watched her shoot through the cat flap on the secret door. She is a Bengal with a striking snow leopard pattern and nowhere is off-limits for Cleo. "She's very good at catching mice, " Agnes told me. "She sleeps under the covers in the dormitory." ﻿﻿I think that Cleo would love the garden of Kellie Castle. It is 6 miles away and the perfect antidote to the dark world of the bunker. There is the sweet smell of flowers, buzzing bees and pecking hens in the walled garden. You can buy apples, rhubarb and oregano that is grown here or munch on rhubarb crumble muffins in the tea room. "It was left to the rooks and the owls who built in its crumbling chimneys... every pane of glass was broken, and swallows built in the coronet in the ceilings." Louise Lorimer commenting on the state of the castle in the 1870s. The Lorimer family rescued Kellie castle from decay and made it their summer home. The famous Scottish architect, Sir Robert Lorimer, spent family holidays here and I found an oak cradle designed by him. It has a highly detailed carving of a guardian angel and a pelican wounding itself to draw blood to feed its young. The castle dates from 1360 and is an unusual "T" shape. In comparison with other castles that I have seen it has less in the way of turrets and towers and is more house than fortress. During my wanderings inside I discovered intricate plaster ceilings. My favourite was the Vine Room where it looks like there are grapes in the ceiling, but these are actually hops- it was believed that hops under the pillow helped you to sleep. In the library there is one of the earliest plaster ceilings in Scotland. It was specifically created for a brief visit by James VI when he used it as a bedroom. There were noisy crows in the trees outside the castle- a non-stop racket. The rain came on heavy just as I was leaving. I donned waterproofs and battled through it. The sides of the roads were flooded and I had to ride down the middle. It was belting down and cars were bringing up a huge amount of spray. The sting from sweat had forced me to close one eye. When I stopped to check I was going the correct way my map got utterly soaked. The experience was thrilling and I enjoyed every minute of that rain fall. It is one of the reasons I love cycling so much- it forces you out of your usual comforts and it tests you. Eventually the downpour ended and the sun came out. There is an obvious jubilation and beauty that comes after such a torrent. Birds sing loudly, perhaps in celebration. I spotted a bullfinch perched on a hedge and a blackbird surveying the scene from a telegraph line. The ground started to steam as the sun warmed the water, creating an eerie ankle-height mist in the fields. Ahead of me there was layer upon layer of rounded hills with a line of mist and flash of sunlight. Thank goodness that the world of secret bunkers is behind us and we can enjoy moments like this without fear. This can be done as a day trip from Edinburgh. Trains to Cupar take just under one hour. You could also manage it as a daytrip from Glasgow with the train taking about 2 hours, charging in Edinburgh. It is 24km from Cupar to The Secret Bunker. Then 9km to Kellie Castle. From the castle back to Cupar it is 21km. There is some climbing to be done on the approach to Ceres and Pitscottie, but if you come back this way it means a speedy descent to look forward to. There is some traffic to contend with, particularly the stretch of the B940 leaving Cupar which can be busy, but once you get deeper into the countryside it gets much quieter. The Secret Bunker has an admission charge. It is a fascinating place and is very easy to use up 2 or more hours exploring and reading the information panels. Kellie Castle also has an admission charge. This can be done as a day trip from Edinburgh., but if you wish to stay in the area there is the luxurious Peat Inn or you could stay in one of the picturesque fishing villages, like Pittenween, a short ride way. Both The Secret Bunker and Kellie Castle have cafés. The novelty of having scampi and chips and a beer 100 feet below ground has to be experienced.